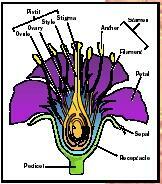 Structure of angiosperm flowers. Redrawn from Van de Graaff et al., 1994. In leaves, dermal tissue contains specialized cells called guard cells that make up structures called stomata . Stomata facilitate the exchange of gases in the leaf. Carbon dioxide (CO 2 ) diffuses into the leaf through the stomata for use in photosynthesis, and oxygen (O 2 ), the waste product of photosynthesis, diffuses out of the leaf through stomata. Stomata are also crucial for water transport through the xylem . Stomatal opening results in the evaporation of water from the air spaces of the leaf. This creates negative water pressure that pulls on the column of water in the xylem. The evaporation of water from the stomata is the main driving force for water transport through the water. In roots, epidermal cells have a specialized structure that facilitates water and nutrient absorption, the main function of the root. Some of the root epidermal cells have long membranous extensions called root hairs that increase the absorptive surface area of the root. Root epidermis also interacts with symbiotic fungi that form mycorrhizae , which increase nutrient absorption. Transverse section of tissues of a dicot root. Redrawn from Van de Graaff et al., 1994. 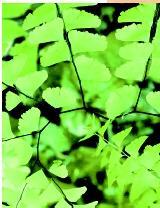 A photograph of a maidenhair fern, showing its shoot system of stems and leaves. Plant Anatomy Images. University of Rhode Island. <http://www.uri.edu/artsci/bio/plant_anatomy/images.html> .